1 Week Kite Safari on the Red Sea - Join us in a kitesurfing adventure on our 40m yacht, with space from 9 up to 24 guests! You will arrive on board on every saturday and we will leave for a week, exploring the lagoons and the islands of the Red Sea. Stable winds and shallow waters, and a lot of kitesurfing. We will have morning, afternoon and sunset sessions, a great occasion to improve your riding skills or to start learning kitesurf from zero. And when you are not kitesurfing, you will eat, chill and party on the boat with kitesurfers like you. The boat is available all year round, we have already several trips planned and confirmed, just contact us to get more info! 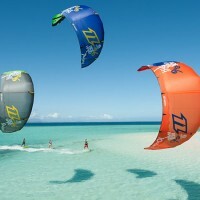 Join us for a kitesurfing adventure! Sick Dog Surf organizes kite safari boat trip in the Red Sea, Egypt, 40m Yacht with up to 24 spots available!